Greg has lived in and birded Northwest Ohio since the age of 7. He has served as President, Vice President, Field Trips Chairman and Rare Bird Alert Compiler for the Toledo Naturalists’ Association, one of the largest, longest-standing and most respected Ohio nature clubs. A former member of the Ohio Bird Records Committee and author of “The Status of the Birds of Northwest Ohio”, there are few people who know the local birds and birding spots better than Greg. Known for his enthusiasm and high energy, Greg has led successful expeditions to Central and South America, Africa, Mexico and all over the US and Canada, and recently co-founded a small birding tour company. As much as he enjoys traveling for birds, there is nowhere he’d rather be in May than right here in the western Lake Erie region. 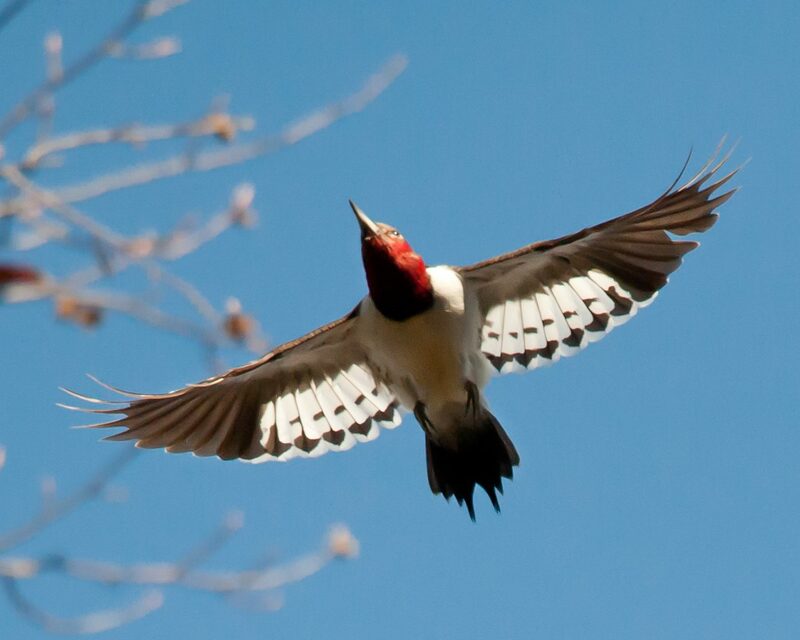 Like so many birders, I have long been captivated by the mere mention of “Ivory-billed Woodpecker.” As a child, I stared with wonder at the illustrations of the Ivorybill in my Golden guide and Peterson guide. Published in 1966, the Golden Guide said it was “on the verge of extinction…last reported from the deep forests of TX, LA, SC and FL.” This was more than 2 decades after Tanner’s seminal work in Louisiana’s Singer Tract. Since then, “unverified” reports have filtered in from Texas, Florida, Louisiana, Mississippi, Arkansas and elsewhere. If you are reading this, then you surely have seen photos taken of an East Texas bird, video taken in Arkansas, video taken in Florida and sound recordings of various call notes and knocks from different locations. The people behind many of these aren’t your average backyard feeder watcher. They are scientists, teachers, ornithologists, experienced outdoorspeople whose reputations and even lives would be shaped by their observations. That they would be incapable of using reason and logic over emotion and “want-to” in every single instance seems preposterous to me. The burden of proof for establishing this species’ continued survival has become unimaginably high. I’m not sure why or when looking for Ivory-billed Woodpeckers became akin to looking for the Loch Ness Monster or Sasquatch. With 20/20 hindsight, I recall the Gene Sparling sighting of 2004 in Arkansas that turned into the David Luneau video that turned into the Cornell University conservation event of the century and wonder if that had been managed differently, would there be so little attention to the efforts since. In 2006, Geoff Hill and his Auburn group in Florida managed to compile some fascinating and in my opinion, diagnostic evidence of the IBWO’s existence. That evidence received virtually no attention from the so-called experts. For the life of me, I cannot understand why, other than perhaps for fear of misplaced ridicule from colleagues. As written on the pages of this blog, and according to multiple sources, there have been “controversial” sightings in 1946, 1948, 1949, 1950, 1951, 1952, 1955, 1958, 1959, 1962, 1966, 1967, 1968, 1969, 1971, 1972, 1973, 1974, 1976, 1981, 1982, 1985, 1986, 1987, 1988, 1999, 2004, 2005 and 2006. Since 2006, there have been sightings in 2007, 2008, 2009, 2010, 2013, 2014 and 2015. Despite my own search efforts here in the US, my only experience with Campephilus woodpeckers is in the New World tropics. I have seen and heard Red-necked, Crimson-crested and Pale-billed Woodpeckers and each and every time I have encountered one, I’ve been taken back to my early days of looking at that Golden Guide, imagining what it would be like to see an Ivorybill. Undeterred (and/or encouraged!) by events of the past or potential backlash from the present, Project Coyote is undertaking perhaps the most prominent known search today in the United States. There are two pieces I’d like to discuss. Let’s completely forget about color for a minute and look at shape and structure. First, the overall appearance of this bird looks very long and slender. I have seen hundreds (thousands?) of Pileated Woodpeckers in life and viewed countless photographs online of Pileateds clinging to a tree. Virtually all have had a bulkier look to them. Even more striking to me is the neck. Specifically, its length and shape strongly suggest Campephilus. Almost every available image of Ivory-billed Woodpecker (as well as many other Campephilus species) shows a long, slender neck much like the bird depicted in this photo. There is a 1937 photo by Tanner of a female Ivory-bill at her nest that even shows a similar neck position. Pileateds simply don’t look like this. 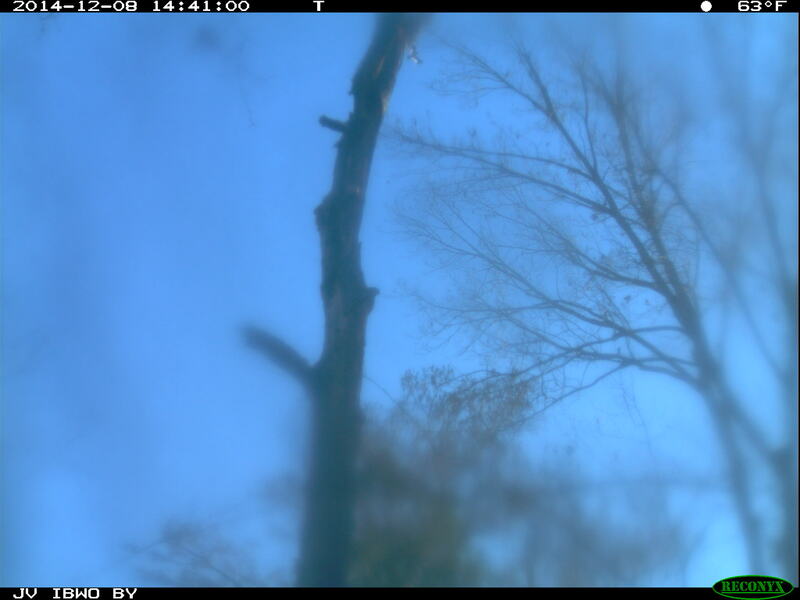 In my opinion, the bird shown in this photo is likely an Ivory-billed Woodpecker. I have no doubt that there are a few Ivory-billed Woodpeckers hanging on. The evidence is substantive and recent. I look forward to joining the Project Coyote team in the field soon to help them in their efforts. I applaud them for making their search results public on this blog. When the day does come that the clear images or videos are taken, what then? We’ll cross that bridge when we arrive. I hope that Greg will join in and respond. For my part, this image was the one I initially found most intriguing, for many of the reasons Greg articulated – the white on the wings reaching the primaries (it’s far more extensive than the white on the linked-to RHWO’s wings) and the apparent size. 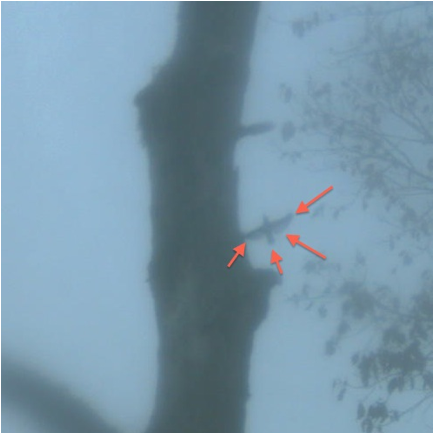 The wingspan is considerably greater than the Red-headed Woodpecker in this deployment, which appears to have been closer to the camera. At the same time, the GISS on two or three others from that series is a bit more ivorybill-ish to my eyes. 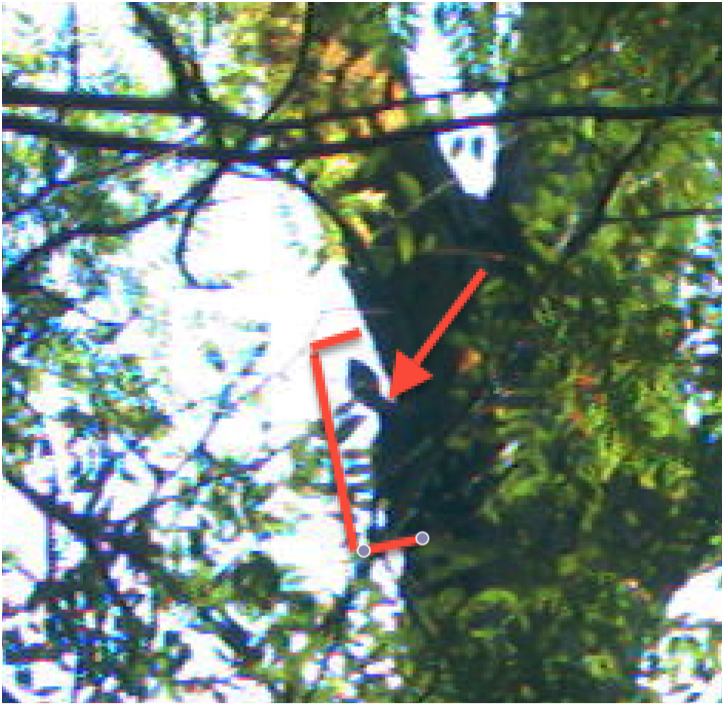 The camera angles and distances may be different, but when the two subjects are resized similarly, the proportions can be compared: https://drive.google.com/file/d/0BwTmMmXDrBKnVXNLaXRmY1lqTms/view?usp=sharing I haven’t been able to overlay the outline of one on the other yet, but I think they’d be very close.